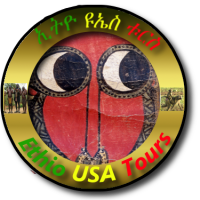 Ethio USA Tours is committed to providing amazing tour packages and excellent customer service. Our goal is to exceed your satisfaction and expectations for your trip. In fact, our slogan is "Distinctive ETHIOPIAN Travel" and we aim to provide experiences that other travel compaines simply cannot provide. Ethio USA Tours is one of a hand full of tour companies based in the United States that engaged in the tourism industry . We provide both Inbound tours to the US and outbound tours to East Africa, but we specialize in Ethiopian tourism. The joy of traveling is that it can be enjoyed virtually anywhere in the world. Yet one of the best countries for breathtaking scenery, rugged but majestic mountains, exotic flora, fauna (mainly endemic mammals, birds, plants) and pristine cultural diversity maintained by perpetual history is undoubtedly Ethiopia. Ethiopia occupies most of the Horn of Africa. The country covers approximately 1,127,127 square kilometers and shares frontiers with Eritrea, Sudan, Kenya, Somalia and Djibouti. The major physiographic features are a massive highland complex of mountains and plateau divided by the Great Rift Valley and surrounded by lowlands along the periphery. The diversity of the terrain is fundamental to regional variations in climate, natural vegetation, soil composition. And settlement patterns.This colorful country can cater all types of tourist, Adventurous or comfort –loving and any kind of tour in the interest of the travelers. In the North, the ancient stele-fields and Rock –Hewn churches of Lalibela and Axum show the world‘s oldest Christian culture very much alive; The ethnic minorities of the south will give a glimpse into timeless Tribal life styles .the East can show you a relaxed and tolerant Muslim culture living in peace .Nature reserves in low-and highlands make for unforgettable hiking and game watching adventure Visiting Ethiopia is once –in-a- lifetime experience.Ethio USA tours will make sure that your clients or family ,friends get the best of what this country has to offer.